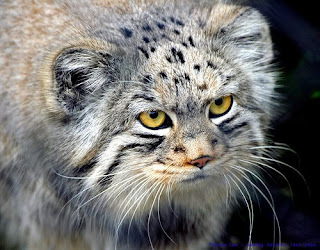 Pallas' Cat (Felis manul), also known as the Manul, is a small wild cat of Central Asia. It is about the size of a house cat, at 60 cm (24 in) long, not including its 25 cm (10 in) tail, and an average weight of 3.6 kg (8 lbs). Its fur is ochre in color with vertical bars, which are sometimes not visible due to the thick fur. This cat has several features that distinguish it from other felines. Most strikingly, it has round pupils. Its legs are short, the rump is rather bulky, and the fur is long and thick. 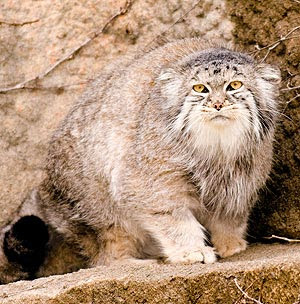 The combination of its stout posture and its thick fur makes it appear especially buxom and plushy. The fur changes between the seasons: the winter coat is greyer and less patterned. Its ears are set low and give the cat a somewhat owl-like appearance. 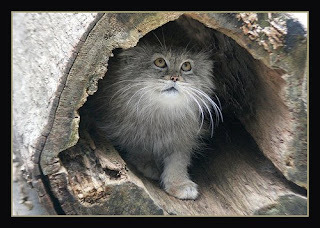 Because of its relatively flat face, it was once thought that it was the ancestor of the Persian cat breed. 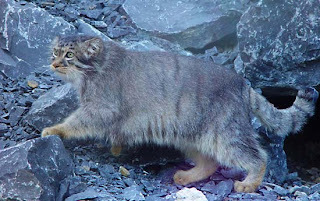 For a long time Pallas' Cat was hunted for its fur, but it is now protected in most areas, for instance in China. 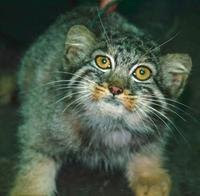 Since this cat feeds on agricultural pests, it is regarded as beneficial. However, poisoning of pest rodents and pikas may also affect the cat. 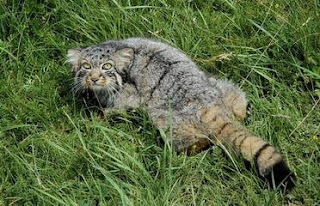 Successful captive-breeding of Pallas' Cat is difficult। Although it breeds well, survival rates are low owing to infection. This has been attributed to an ineffective immune system, as its normal isolated habitat doesn't normally expose it to infection.